The heatguard water mixer by Cash Acme is a sleek and compact Thermostatic mixing vakve that fits discreetly under the sink. It's easy to install, has accureate temperature control, and has a wide range of pressure flow for maximum comfort for the user! Smart Water Managment Made Simple! 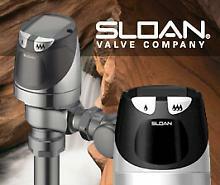 The new and improved Sloan Optima faucet line is now easier to install and maintains faucets by 50%! With 8 different deck mounted faucets and 2 wall mounted faucets, Sloan's new faucet line is not just effiecent, but has a number of styles to choose from. Additionally, all mounting hardware and quick-connect spout hoses are now included. 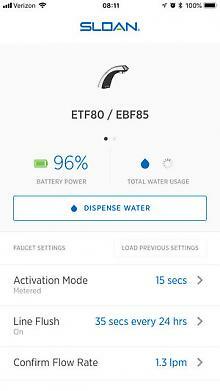 The most impressive feature of this new product line is you can adjust the settings and monitor you water usage from your phone! 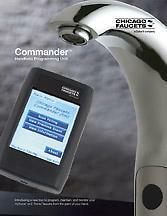 Chicago Faucets offer the Commander to gain valuable information from electronic faucets. 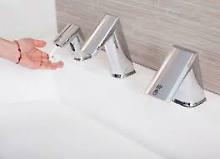 Simply point the hand-held device to the faucet to program, perform diagnostics, and retrieve run time data from your Chicago Faucets. The Commander can be a valuable resource to any infectious control department. 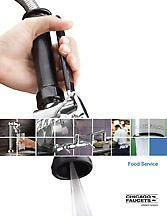 Chicago Faucets offers an extensive line of faucets and pre-rinse units that are designed to meet the demands of the food service industry. 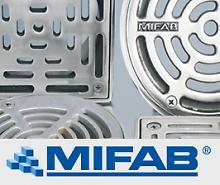 Chicago products are durable, flexible and can also help to reduce water usage. Sloan is not new to the fixture business. Our fixture line is an extension of an engineering platform that has been the foundation of the plumbing industry for over 100 years. Sloan’s long history of Flushometer design brings a unique understanding of fixture dynamics. Our pioneer efforts in pressure- assist technologies paved the way for tank-type pressure designs. 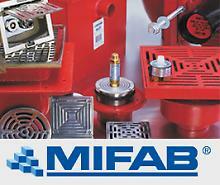 Sloan, more than anyone, understands the relationship of bowl hydraulics and valve design. The Siphonic principle has been understood for thousands of years based on mathematical calculations that were documented in the 16th century. These roof drainage techniques have been practiced worldwide for over three decades and provide a superior solution to conventional gravity based systems. New SOLIS® Flushometers, part of the Sloan SOLIS Collection, are the industry’s first solar-powered, sensor-activated Flushometers. 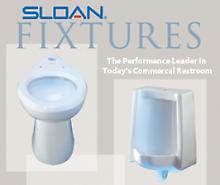 Sloan SOLIS Flushometers for water closets and urinals provide ground-breaking water efficiency and utilize state-of-the-art photovoltaic technology.